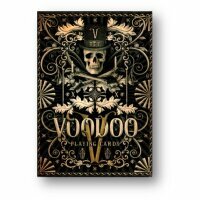 De'vo's Signature Series - Exquisite Special Players Edition by world-renowned playing card expert De'vo and amazing artist Anika Burrell - comprises some of the rarest and most sought-after playing card decks in the world! Their previous limited editions sold out just minutes after release, and have been seen in Stan Lee's Superhumans, thrown by Rick Smith Jr. - Current Guinness World Record Holder. 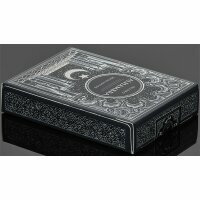 De'vo and Anika have teamed up again for this very Special Players Edition that is designed specifically for playing cards or performing magic. And, it's a MUST for all collectors! These amazing cards are printed by the USPC on the finest stock and finishes in the world! Numbers and pips are in the top left and bottom right corners for playing cards. Numbers and pips are smaller and in the corners. Amazing repeating court cards make card recognition and playing games very easy! Anika's detail is incredible! Both faces AND backs contain De'vo's signature "Twin Tip" design, meaning that you can get different fans depending on which way the decks are fanned. 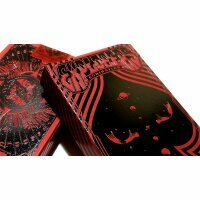 Also included are special GAFF cards for doing magic tricks! Magicians will love the Jokers, which enable an image of a spectator's selected card to appear in an image of a wine glass! Don't miss out on this LIMITED EDITION release by De'vo and Anika Burrell! These will go FAST! Get yours today!